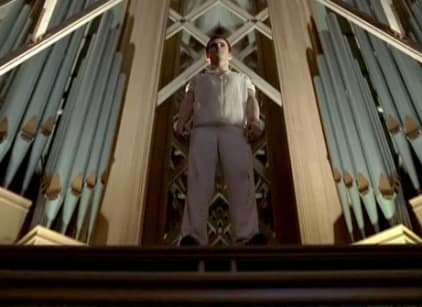 We meet back up with Godric and Sookie in the cell, just as Eric arrives at the church. Godric orders them to leave together, but asks they spill no human blood. On the way out, Steve Newlin and his little lockdown gang stop Eric and they chain him down with silver. Meanwhile, Bill manages to crack a plasma scren over Lorena's head and escape. Jason, fresh from being shot... with a paintball gun by Sarah, comes storming back to the church. Bill, an army of Godric's local vampires, and Jason all arrive to the scene and take down Steve and crew. Just as they're about to kill them, Godric arrives and spares their lives. At a party for Godric's return back at his place, Godric reveals that he willingly let the humans capture him to try and improve human-vampire relations. Lorena shows up at the party and starts trouble with Sookie until Godric takes control and banishes her from Dallas for threatening Sookie, who helped him. Also at the party, Godric thanks Jason and tells him he has friends in Dallas. Eric, however, is leased pleased with Jason and still remembers him as a buyer of V, but tells him they're now even. Meanwhile, Hoyt and Jessica were busy banging it out in the hotel when Bill had to take off to rescue Sookie. He demanded they go back to Bon Temps, which they did, where they tried again only to discover Jessica's heiman grew back and it'll be like her first time every time. Sam gets a phone call from his bar and when he shows up, he finds Daphne, missing her heart, in his meat locker. Sam goes to call the Sheriff, but it's already too late, they're outside his place. As he's getting interrogated, Andy tries to support his story but they're looked at as crazy and Sam is thrown in jail. Eggs comes to Tara telling her he blacked out but has the guilty feeling he did something. Meanwhile, Maryann is slicing up Daphne's heart and makes a hunter's souffle she feeds to Tara and Eggs who eat the whole thing up. The two of them then start beating each other up as their eyes turn black. At the end of the episode, Luke shows up to the party at Godric's with his entire body covered in silver with a bomb. He pressed the detonate button and we cut to credits. Sookie: He's your maker isn't he? Eric: Don't use words you don't understand. Sookie: You have a lot of love for him. Eric: Don't use words I don't understand.